New , near new and “Little Used” items at great prices. PayPal protects you when you don't receive a The Little Used Store item you've bought, or if an item you've received is significantly different than it was described. Use PayPal to purchase an eligible item on The Little Used Store. Pay for the full amount of the item with one payment. Items purchased with multiple payments-like a deposit followed by a final payment-are not eligible. The "Send Money" tab on your PayPal account overview page by sending payment for "The Little Used Store Items". Of course we will do everything we can for our customers to have a satisfactory experience on our web site, but if you feel you need to you can a Dispute within 60 days of the date you sent the payment-then follow the online dispute resolution process. 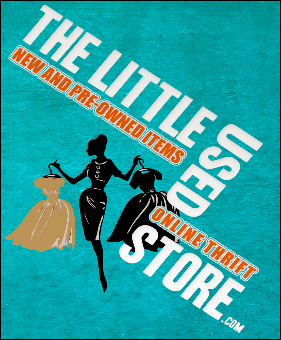 How do I know if I'm purchasing an eligible item on The Little Used Store? Look for the buyer protection message in the The Little Used Stores listings. If you see this message, and you meet the eligibility requirements, then your purchase is covered by PayPal Buyer Protection. How much coverage do I get with PayPal Buyer Protection? If you see the The Little Used Store.com buyer protection message, and if PayPal finds in your favor on your Claim, PayPal will reimburse you for the full purchase price of the item and original shipping costs-with no cap on coverage. The amount of coverage varies based on the The Little Used Store website where the purchase is made. PayPal will not reimburse you for the return shipping costs that you incur to return a Significantly Not as Described item to the seller or other party PayPal specifies.